Guild Wars is in the throes of its first ever World vs World Season this month – a global tournament of large-scale inter-server fisticuffs – and won’t be done till November 21. A new league starts today, and the developers are hoping a beta map packed with “new innovation” will alleviate some painful queue times and see the heart of the game’s PvP pump a little faster. Edge of the Mists is an ever-so-slightly smaller map than predecessors Eternal Battlegrounds and Borderlands, but stuffed with much more variety. Each of its several floating islands will play host to a different environment – a winter fortress, a dilapidated jungle temple, and a desert with a “bizarre feel”. Fights will be faster and more focused, and matchups should be resolved and reset within a single day. To help tackle queue times as player numbers continue to rise, Edge of the Mists has an overflow copy, available via the WvW drop-down menu. This arbitrary player distribution means fighting on the map won’t currently affect scores in server matchups – but players will be able to earn WXP and rewards unique to Edge of the Mists. Entry will be invite-only, but guilds will be encouraged to apply for access in the near future. 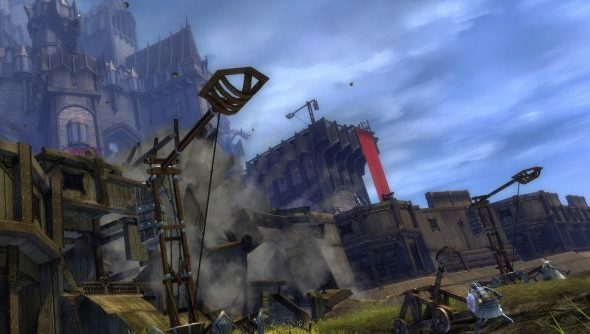 ArenaNet have split North America into four leagues of nine servers and Europe into three for the duration of the competition. The idea is that players on each server are getting variety of match-ups and a sense for their overall standing on this green-blue planet we call home. Do you think it’s working?